Joey Calistri battles to win a header over a defender. The junior forward tallied one assist in Northwestern's most recent win over Valparaiso. If Northwestern men’s soccer played in the English Premier League, they would be last season’s Chelsea: solid across the back but not intimidating on the attack. Following their defense-first approach, the Wildcats (3-1-2) have gotten off to a fairly predictable start. They’ve won the games they should have, dropped a match to a very good Ohio State team and have already fought to two draws, a fairly common result for a team that doesn’t score a lot of goals. The wins have come at home against Quinnipiac, Hofstra and Valparaiso, a fairly easy slate that NU has tidily handled by a combined 6-0 margin, and both draws came on a road trip to California in consecutive games at UC Santa Barbara and Cal State Fullerton. Heading into the bulk of their conference schedule, the Cats haven’t blown anyone away but look poised to compete for yet another Big Ten title. Leading the charge for offense-starved NU is junior forward Joey Calistri, one of the best players in the conference and a legitimate threat to score every time he touches the ball. The owner of 21 goals through his first two years, Calistri currently leads the team this season with three scores. Feeding him the ball through the middle are two midfielders, sophomore Brandon Medina and junior Cole Missimo. Medina was a front-runner for Big Ten Freshman-of-the-Year honors last season before tearing his ACL, and has reemerged this year with one assist in two starts. Missimo, meanwhile, has become the heir-apparent to the graduated Chris Ritter, who now plays for the Chicago Fire. Ritter was renowned for his balanced game, matching defensive prowess with precision strikes, and Missimo has stepped up to fill the void with two goals and stout play on defense thus far. In the back, the Cats’ conservative strategy is anchored by two seniors, centerback Nikko Boxall and goalkeeper Tyler Miller. Boxall is a hard-nosed enforcer who has also showed his abilities on set pieces this season, coming up to score a goal and contribute two assists. Behind him, Miller has led the way to four clean sheets, bringing his career total to an impressive 31. 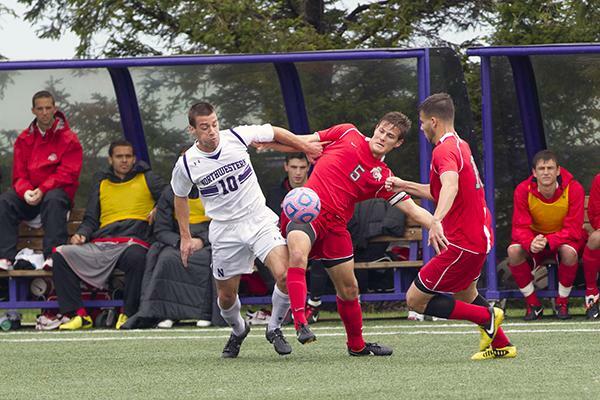 Wednesday’s 1-0 win over Valparaiso was a classic NU match. The two sides were locked in a scoreless tie throughout the first half, but the Cats were finally able to break through early in the second. Calistri got around a defender and crossedthe ball to Missimo for an easy finish from six yards out. From there it was smooth sailing for NU. The team rode three saves by Miller to a low-scoring victory. Looking ahead, the Cats face an in-conference match at home against Michigan on Sunday. The Wolverines are just 1-3-1 this season, with their only win coming against the lackluster Southern Methodist University, and the Wolverines have just four goals scored. With no big scoring threat to speak of, Michigan should be easily handled by NU when the Cats tally a score or two on their counterattacks. Key games this season will be at Indiana on September 28, against newcomer Maryland on October 5 (both traditional college soccer powerhouses) and at Michigan State on October 26. If NU can win at least two of these games, they’ll put themselves in a great position to compete for a third Big Ten championship under coach Tim Lenahan.